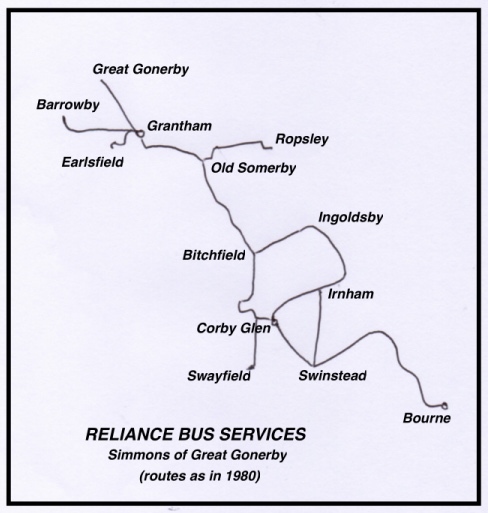 The Reliance business was founded in Gonerby by the Simmons family when they bought their first bus in 1924 and their local routes from Grantham north to Gonerby and west to Barrowby started at that time. But there were other operators on these routes too such as Whipple, Pulfrey and Girdlestone. Wilfred Simmons acquired the Whipple business in 1930 bringing also country routes south-eastwards from Grantham to Ropsley, Corby Glen and Bourne. They also gained Girdlestone's timings on the Gonerby and Barrowby routes in 1933. Lincolnshire Road Car were also present in Grantham from 1928 and developed both town and country routes from their Hunting Tower Road depot. Road Car was to bcome the predominant local operator (by acquisitions) with interurban routes in all directions to Lincoln, Sleaford, Bourne, Stamford, Melton Mowbray and Nottingham. Local town services in Grantham had been started in the late 1920s by two operators, J Bland and A Crabtree, both of whom sold their businesses and routes to the Road Car in 1936. Work on a corporation-owned bus station on land off St Peters Hill was started in March 1931 as part of the government's unemployed persons grant scheme and it opened in January 1933. The Reliance garage was originally at the top of Gonerby Hill, which was once reckoned to be the steepest hill on the Great North Road between London and Edinburgh. A preserved petrol pump, restored in 2003, adjoins the former garage site - this was 47 High Street and the fleet was housed in a re-erected surplus aircraft hangar. The Reliance premises were at the northern end of the village whilst Pulfrey was based at 1 High Street at the southern end, nearer to Grantham town. 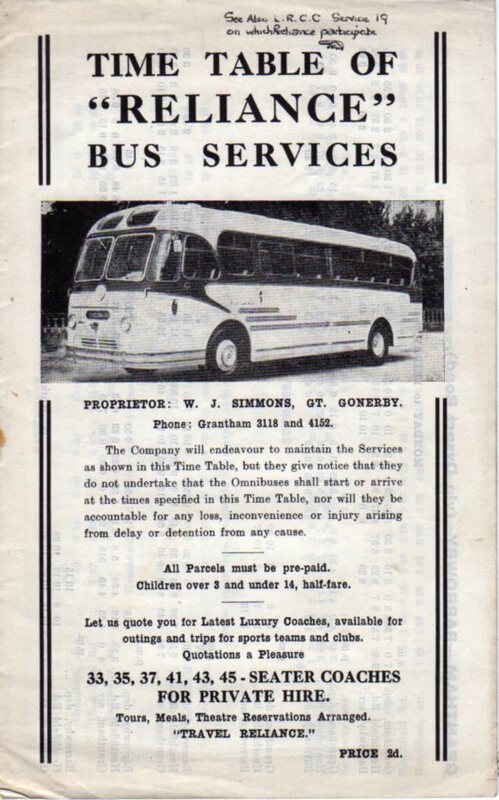 The timetable booklet illustrated from this Lincolnshire operator is undated, but would come from shortly before 1962 as the town service from Grantham to Earlsfield Estate started in that year is not included. Some of the timetables shown have a rather odd imbalance of timings, this is because of shared operations with other operators (eg Road Car and the other operator then based in Gonerby, Pulfrey, who operated between Grantham and Newark via Gonerby). The timetable cover has a hand written note that the Road Car route 19 has co-ordinated timings with Reliance. Much housing growth occured over the years in the Dysart Road and Earlsfield areas of Grantham, traversed by these routes. A trading loss was reported by the company in 1956, resulting in withdrawal of three vehicles and drivers. The former service to Bourne had a chequered history, being withdrawn in 1957 although it reappeared later. Joseph Simmons (son of Wilfred) took over management of the business in 1958. Eight vehicles were then in the fleet. 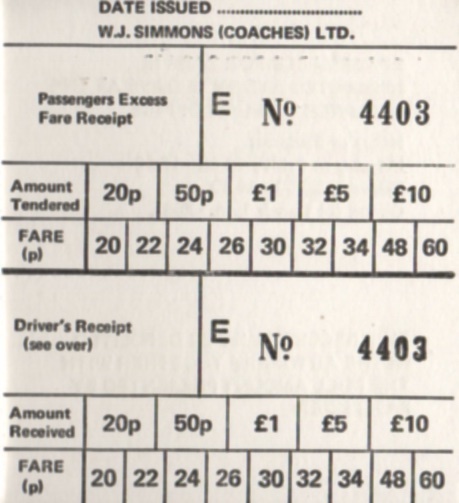 One man operation was the rule from 1962 and exact fare operation came in 1971, although drivers carried a float of change. The fleet size in 1973 was thirteen vehicles. In 1977 the routes in operation were Grantham - Corby - Swinstead - Bourne (weekdays, an extension of the Irnham and Swinstead services in the timetable booklet, and introduced in 1976 when Road Car withdrew service 20 Grantham - Bourne - Spalding); Grantham - Ingoldsby - Corby - Swinstead (Saturdays); Grantham - Ropsley (daily); Grantham - Gonerby (daily); Grantham town service south-westwards to Earlsfield, Goodliff Road / Stour Court (daily, joint with Road Car service 19, as mentioned above); and Grantham town service westwards to Heathfield Road / Barrowby (daily). The business became a limited company in 1978, W J Simmons (Coaches) Ltd.
Further housing development to the west of Grantham led to a new circular route to Barrowby Gate being introduced in May 1980, running anti-clockwise, outwards via Barrowby Road and returning via Dysart Road. 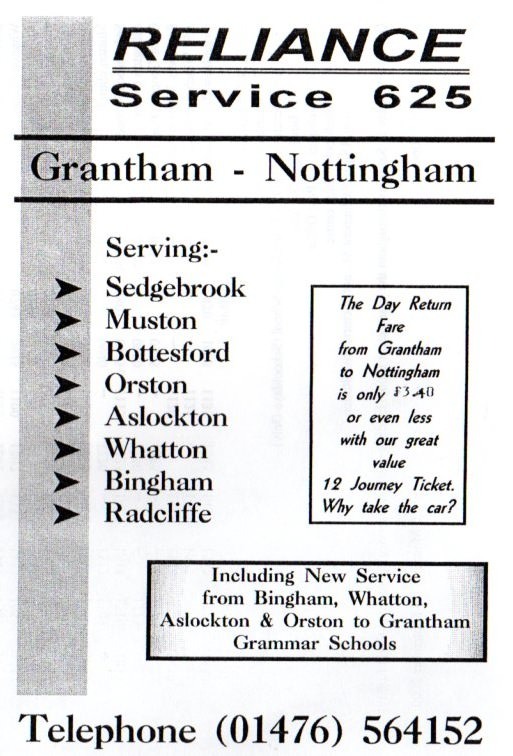 Two years later in 1982 Reliance introduced the Grantham - Bottesford - Bingham - Nottingham replacement route, running up to eight times a day, when through journeys on the previous jointly operated Road Car and Trent service ceased. 1984 was an important year when the old bus station on St Peters Hill was closed and replaced by the current facility in Wharf Road from 19th March. Fleet size in 1985 was sixteen, comprising four buses in a red and cream livery along with twelve coaches in black and cream (one of which was a 17-seater Ford Transit / Reeve Burgess mini-coach). Twelve of the vehicles had been bought new, the oldest in 1970 and the newest in 1985. 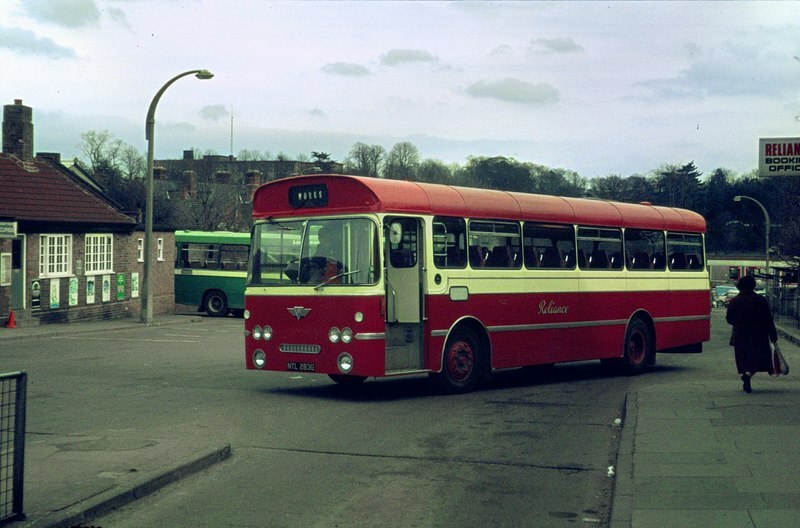 Deregulation of bus services in 1986 brought some changes with Reliance becoming principal operator to Earlesfield and operating competitively on a new daytime route eastwards to Alma Park estate as well as gaining council contracted evening and Sunday journeys on traditional Road Car town routes to Alma Park. 1987, the year after deregulation saw two areas of Grantham - Alma Park and Earlesfield - being served by the buses of three companies: Reliance, Pulfrey and Road Car. Routes were to come and go but from May 1993 Reliance and Road Car were co-operating again with joint operation to Earlsfield. The 1997 route list appears in a table below. 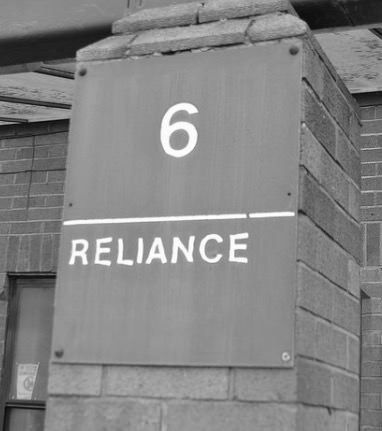 A town office was maintained by Reliance in Guildhall Street, Grantham. 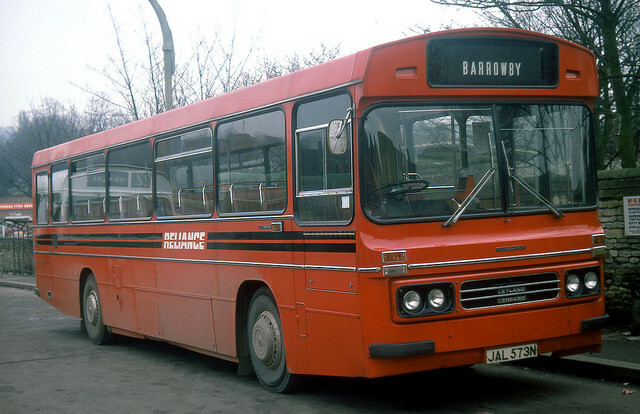 The timetable for 2000 shows a half-hourly service on route 400 to Gonerby, a half-hourly service on route 501 to Barrowby and eight return journeys on the 625 to Nottingham, plus peak-hour short workings to and from Bottesford. Some 625 journeys were diverted to run via Gonerby and Allington; others via Orton and Aslockton. Change was to come to the business with change in ownership in mid-2003. Bell Punch tickets above. Autofare overpayment refund ticket below. Turning to the more recent story of the town services in and around Grantham, the Reliance business was acquired from Joe Simmons by Mass Transit of South Anston near Sheffield in mid-2003 (the name comes from the founder Michael Alan Strafford). They opened a new depot in Tollemache Road on the southern outskirts of the town in March 2004 and extended their operations beyond the original Reliance routes by taking over some of the Road Car services from 31st May of that year, when the Road Car depot in Hunting Tower Road, Grantham closed. This followed a dispute with local staff over trade union recognition. Mass then took over all Road Car's town services as well as the country routes to Colsterworth, South Witham and Sleaford. (Interurban services into Grantham continued to run from the Road Car depots in Lincoln and Newark respectively). Day-to-day running of services in Grantham would be by Mass Transit-owned Reliance Travel, with the buses running under the Mass Reliance name, while coach services will run under the name of Reliance Travel. Depot manager at this time was Andrew Simmons (grandson of Wilfred, son of Joseph). Predominant vehicle livery was dark blue with yellow trim and some buses were lettered as 'Grantham's Own'. Operations by Mass Transit proved to be unreliable and were the cause of much public complaint; there were cutbacks in November 2004 with some services withdrawn and others halved in frequency. Mass finally withdrew from Grantham after only nine months in February 2005 because of a deteriorating financial situation, losses were stated to be over £300,000. The Reliance subsidiary had gone into in liquidation in November. With hindsight Mass may have over-reached themselves and by their founder's own admission they should probably not have come to Grantham in the first place. They continued, however, as substantial school bus providers in Yorkshire, trading as BrightBus, until the retirement through ill health of the proprietor in 2017. From 12th February 2005 the Grantham town services passed to Centrebus, an operator with other networks in Leicestershire, Hertfordshire, Derbyshire, Luton and St Albans. Initially taking over eight vehicles and twenty staff and the Tollemache Road depot from Mass the Grantham routes were then rationalised to a core operation of viable services. Some of the areas of the town did seem to have been overprovided for at times. The town service to Barrowby Gate was being operated by Pulfrey at this time (previously, since 1980, it had been provided by Reliance - date of change not recorded) and this passed to Centrebus in July 2005 as their route 3. But there were still two local routes - town service 620 to Sunningdale via Belton Avenue and country route 605 to Woolsthorpe via Denton - that remained with Pulfrey until April 2010. By November 2007 the Centrebus fleet at Grantham comprised sixteen buses, of which six were double-deckers, all ex-Travel West Midlands. Six of the single-deckers were ex-Reliance. Routes 602 from Grantham to Newark (replacing Road Car), 608 to South Witham and 609 to Sleaford followed. In April 2010 the Grantham town network of Centrebus was considerably enhanced and expanded as part of the county council supported 'IntoTown' services already provided in several other Lincolnshire market towns including Sleaford, Boston and Spalding. Working in partnership with Lincolnshire County Council, a fleet of seven new low floor buses was purchased for use on routes around Grantham. The popular cross-town Alma Park to Earlesfield service 1 was increased to run every 20 minutes whilst other areas such as the District Hospital, Barrowby Gate, Sunningdale, Great Gonerby and Somerby also benefitted with the introduction of half hourly services running throughout the day, six days a week (routes 3, 4A and 4B). A regular service to the rail station was provided for the first time in recent years. This £850,000 investment was backed up by improvements at bus stops, and the rolling out of a real-time satellite-based passenger information system funded by the county council. So Grantham’s local bus network was transformed to ensure that the 21st century transport needs of residents and visitors could be met sustainably. Then in July 2011 Centrebus took over long established independent operator Kimes of Folkingham when the co-operative formed in 1997 came to an end following the sudden death of Paul Brown the operations manager. The Kimes rural routes melded well with the Centrebus network. Another significant purchase by Centrebus was that of Veolia Transport (Paul James Coaches) in October 2011 with their operations and base at Saxby near Melton Mowbray. Subsequently the ex-Kimes depot at Folkingham was closed at the end of August 2013 with some routes passing to Grantham depot (eg 26 to Billingborough and 27 to Sleaford), with route 9 passing to Saxby whilst the 12 went to their Corby operation. Centrebus passed the 58 and 59 (Boston - Donington - Spalding) routes to Brylaine of Boston with five vehicles. Further adjustments to the Grantham town service timetables took place in April 2013, with an overall reduction in the offering. Centrebus Commercial Manager David Shelley commented "in January 2010 Centrebus entered into a funded arrangement for the experimental enhancement of a number of bus services in Grantham. This included investment in new vehicles, improvements to a number of existing services, and experimental services in parts of the town not well served by bus. That arrangement came to an end in March 2013, and as a result Centrebus carried out a detailed review of what services can continue given that funding is no longer available. The scheme has been very successful in a number of areas, and passenger numbers have increased significantly in the town. As a result a number of the enhancements are able to continue even though subsidy has stopped. Service 1 in particular retains a 20 minute frequency throughout the daytime period, and buses to Great Gonerby are considerably better than they were three years ago, with a half-hourly service from Grantham for much of the day, and additional buses through to Newark. Areas such as Barrowby Gate, Sunningdale and Somerby also retain a service, in many cases not having many buses at all three years previously. Frequencies have reduced compared to what had been offered during the past three years, but this simply reflects the pattern of usage and the level of public funding that is now available." The 2013 changes would appear to have effected a reduction of three buses from ten scheduled to seven in the daytime run-out for the town services. Sunningdale and Somerby saw even greater reduction in service levels from April 2014, reducing to only four journeys a day on route 9 (which also includes a rural element to and from Denton and Woolsthorpe). August 2015 saw some further reductions at school times and the withdrawal of the Saturday service on route 2 Harrowby. An improved service to the Downtown retail complex north of Gonerby was provided from September 2016 with the through buses on Grantham - Newark route 24 diverted into the shopping centre and the local buses on route 14 Grantham - Gonerby shortened to turn via Green Street in Gonerby. August 2017 saw the total withdrawal of Grantham town service 2 (with 2A peak journeys to the Alma Park industrial area incorporated into new peak time route 1A) and the closure of the depot at Saxby near Melton Mowbray following substantial alterations to services in parts of Leicestershire and Rutland. Saxby depot being replaced by a smaller out-station at Coston, near Waltham on the Wolds. Less than twelve months later the Coston outstation closed after operations on 21st July 2018 and the services were transferred to other depots, with the 55/56 (Melton Mowbray - Grantham) and RF2 (Melton Mowbray - Oakham) passing to Grantham depot. Outwith the Grantham area the 14/15 (Melton Mowbray town service), 23 (Melton Mowbray - Nether Broughton), 25 Melton Mowbray - Stathern) and 113 (Melton Mowbray - Oakham) passed to Leicester depot; and the RF1 (Melton Mowbray - Corby) to Corby depot. Further change came with service 24 Grantham to Newark reducing from hourly to two hourly from 24th July 2018, and on the same date Grantham town service 1 (Earlsfield - town centre - Alma Park) reduced to half hourly at peak periods (still twenty minute frequency during shopping hours). One sole early morning journey remains for route 1A via Sunningdale. From 3rd September 2018 route 4 (Grantham - Corby Glen - Stamford) passed from Centrebus to Call Connect as a contract change - the northern half of this route was an important service for Reliance in day gone by. Also the 9 from Oakham via Stamford to Peterborough has frequency reductions with abolition of through journeys across Stamford and the Oakham to Stamford section reducing to hourly off-peak journeys only following local government funding cuts. A full hourly service was maintained from Stamford to Peterborough until October 2018 when this passed to Delaine as their route 205. After fourteen years of operation in Grantham and surrounds Centrebus provide a reliable service attuned to the travel needs of the area. Further adjustments to the Grantham area network take place on 7th April 2019 resulting in some withdrawals and lessening of frequencies on town services. Long gone but obviously not forgotten! at Grantham bus station still has the Reliance name. Two more Reliance tickets (courtesy of Simon Brown). On the left a TIM ticket from the period 1960 to 1971, on the right a later Autofare ticket. Leyland Leopard / Duple Dominant JAL573N of Reliance, seen at Grantham in 1978. A one owner bus which operated here for some 25 years. Grantham old bus station (pre-1984) off St Peters Hill in 1979 with Reliance AEC / Plaxton bus NTL283G departing. A 43-seater new in August 1969. Note the Reliance booking office to the right and the Road Car office to the left. Reliance fares were the focus of critical appraisal by the East Midlands Traffic Commissioners, as reported in Commercial Motor. High bus fares were seriously disrupting life in rural districts and making it difficult for rural councils to let houses, the Traffic Commissioners were told. They were hearing objections by Great Gonerby Parish Council and West Kesteven Rural District Council to fare increases on six routes sought by W. J. Simmons and Co. (Reliance) of Great Gonerby. Mr. J. R. Morgan, for the councils, declared that bus companies should look round for ways of economising instead of increasing fares, which added to the cost of living. 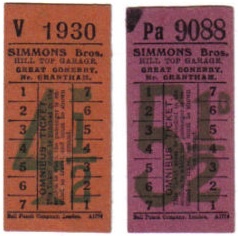 In West Kesteven, the usual pattern was a grant to the Lincolnshire Road Car Co. Ltd., then an application by Simmons to bring their fares into line, and later a similar, though reluctant, application by C. W. Pulfrey, also of Great Gonerby. It was claimed that a company as small as Simmons must have great room for economies. They had some very remunerative services between Grantham and Great Gonerby, Grantham and Ropsley, and Grantham and Barrowby, together with a town service and a works service. 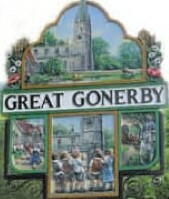 "The fare from Grantham to Great Gonerby has increased from 3d. in 1955 to 5.5d. at the present time," he pointed out. "This is 83 per cent increase, yet no running costs have gone up by a similar percentage." For Simmons, Mr. A. C. G. Rothera said the company lost £348 in 1956, which did not include interest on capital, or remuneration for the management. Three vehicles and their drivers had been dispensed with, but wages were still £41 higher than in 1956. The company wanted to come into line with Lincolnshire Road Car, and only in a few instances would the increases be higher than 2d. or 3d. The application was granted. The story of Reliance appears in 'The Independent Bus' by Keith Turns, published by David & Charles in 1974.